I bought some adorable little asian eggplants, and there they lay, lingering in my fridge, waiting for me to make myself a dinner. I love asian varieties of eggplant, as they tend to be more tender, and less bitter than their larger, Italian cousins. With not much time or desire to put together a large meal for just myself, and even less desire to spend time over the stove on a sweltering 98 degree Philadelphia day, I pulled a recipe from Joe Yohan’s very fun cookbook, “Eat Your Vegetables: Bold Recipes for the Single Cook.” All recipes in this cookbook are vegetable-based, and intended for solo meals. Not too many ingredients, not to much time, but a whole lot of flavor. I altered the recipe a bit to use what I had available – some homemade Coconut Vinegar that my friend Joel gave me (and warned me to open quickly, as the yeast was still alive!) and some roasted almonds instead of peanuts. I also used the same pan and boiling water which I used to steam the eggplant for boiling the udon noodles. Less time – less mess! Altogether, about 6 minutes of total hands-on cooking, and a great, quick dinner. 2 Tbs. of miso, whisked with 1 Tbs. of vinegar (I used homemade coconut vinegar). Add the miso sauce to the ginger, stir. A big diced tomato, or 3/4 cup organic crushed tomatoes, or tomato sauce. Added to the sauce. 1 serving of cooked udon noodles (or soba). 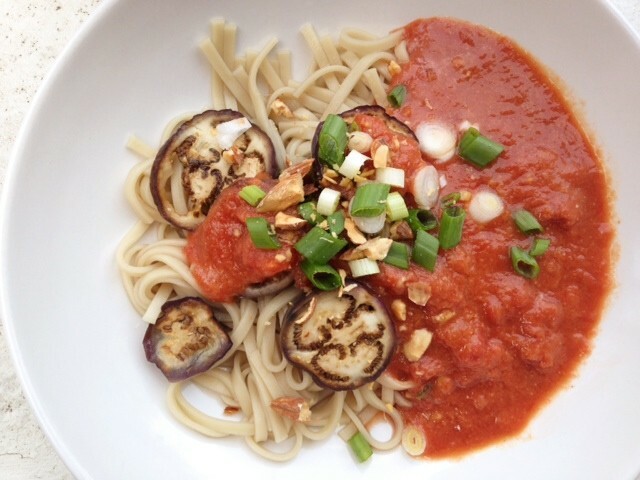 Top the noodles with the eggplants and the sauce, and then garnish with chopped almonds (or peanuts, or roasted sesame seeds) and diced scallion.